Nigeria’s female athletes celebrating after winning medals at the Olympics in 1996. 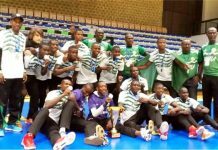 Nigeria, over the years, has recorded some giant strides in sports so much that the country has come to be regarded as one of the major players in the comity of sporting nations across the world. From the game of football, athletics, weightlifting, wrestling, boxing, basketball, among others, the country has left positive imprints in the sands of time. From the 1960’s when Nigeria’s senior national team, Red Devils combated with Brazil, to the 1980s, when they, as Green Eagles lifted the country’s maiden African title, the Africa Cup of Nations, Nigeria has demonstrated her prowess and potentials in the round leather game. Subsequently, the country became the first African country to win a FIFA organised World Cup, when in 1985; the Eaglets conquered the world in China. Subsequent U-17 teams have since succeeded in winning that trophy on unprecedented five occasions. 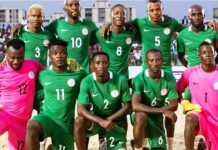 Nigeria has also gone ahead to win the Afro-Asian Cup in Uzbekistan, went to the Senior World Cup, the apex of world football, five times after confounding the world with their exhilarating performance in her maiden outing at USA’94. The Olympic team, christened ‘Dream Team’ also held the world spellbound when they conquered Brazil and Argentina enroute winning football gold medal at Atlanta’96 Olympics. The national U-20 team, the Flying Eagles have also left their mark on the continent and globe. Time was also when the country was a big player in athletics, especially, the sprints. That was the days of Innocent Egbunike, Chidi Imo, Olapade Adenike, Mary Onyali, Beatrice Utondu, the Ezimwa brothers, Olusola Fasoji, etc. In 1996, Chioma Ajunwo stunned the world to earn Nigeria’s first individual Olympic gold medal when she dusted the field in long jump at the Atlanta’96 Olympic Games. Regrettably, the exploits of those years were not sustained by the country as we have been unable to reproduce the feats of those years till date. Suddenly, the country can no longer compete effectively on the tracks, as Blessing Okagbare remains the only visible competitor of note in the sprints, Nigeria’s erstwhile stronghold. Athletics is not the only casualty of the country’s inability to build on her successes. Weightlighting, wrestling and boxing, which for so many years held so much promise for the country, have lost huge grounds to other countries. 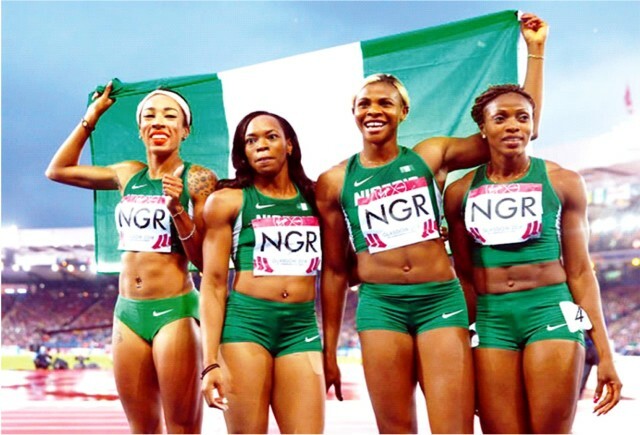 Unfortunately, Nigeria has managed to find herself from one disappointing outing to another at recent world sports competitions, particularly, the Olympic Games and World Athletics Championships. From time to time, it is only the physically challenged athletes that have succeeded in putting the country’s name on the medals table of the Olympiad (Paralympics). The country’s performances at the last two Olympics, London 2012 and Rio 2016, where she failed to win any medal, apart from football bronze, have been disastrous. Even when countries like Kenya, South Africa, Ghana, Ethiopia and others hug the Lead lines with their performances at the games and World, Nigeria has been conspicuously missing from the honours table consistently. Indeed, Sports in Nigeria, apart from football, which seems to be witnessing some kind of renaissance at the moment, are at a sorry pass. The sector is facing tremendous challenges, which if not tackled headlong, would see most of Nigeria teams sinking deeper into oblivion. So, how did Nigeria get to the current state of affairs and what are the major challenges? For the Minister of Sports and youth Development, Barr. Solomon Dalung, the major challenges have been funding, sponsorship, planning, transparency and accountability. Corporate Sponsorship of sporting events and athletes have been a sticking point in Nigeria. While it has been difficult for the private sector to sponsor or invest in sports development as much as would be ideal, access to funding, even from government has been a major issue. These have seen some visions and programmes die on the drawing board. 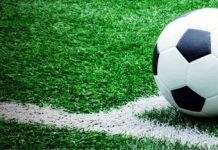 The President of Sports Writers Association of Nigeria, SWAN, Comrade Honour Sirawoo believes that the country cannot get it right until there is a functional sports policy which is geared towards the revival of grassroots sports development and corporate investment in sports. The practice in sport, he said, is that it takes between 10 and 12 years, from when a young talented athlete is discovered to when he could possibly be standing on the podium receiving an Olympic or World Championship medal. The period in between would be years of nurturing, of uncommon dedication and discipline, of high-level training and competitions, of sweat, tears and blood. Only the very best ever survive the rigours and emerge a possible champion at the end. It is a minimum 10-year grueling odyssey. Even then, there is no guarantee of ultimate success. A whole array of things could still turn up to upset the applecant of plans. That is why there must be a dedicated grassroots development programme to follow athletes throughout their formative and forging period. Comrade Sirawoo noted that with corporate or private sector investment, there would be enough competitions and platforms to wean young talents to stardom. A renowned athletics coach, Tobias Igwe, popularly known as ‘Toblow’ at different times had said that grassroots sports is synonymous with schools sports. And that focus must be on school sports if the country is to bounce back and begin to dominate in other fields apart from football. “Simply put, grassroots sports means schools sports. Nigerian sports have always been anchored on schools, primary, secondary and tertiary schools”. According to Nigeria’s Constitution, every Nigerian child must be in school. There is also the unenforced provision that every school must have minimum, basic, functional facilities for all the children to play. So, mass participation in sports in all schools is essential. At the end of the days, a percentage of them are discovered as exceptionally gifted in particular sports. The process of excelling in sports inculcates in the child the attributes of discipline, friendship, fair play, good conduct, high morals, abstinence from bad habits, leadership, patriotism, determination, team work and the spirit to accept failure only as a stepping stone to bigger success. These are essential life tools that the uninitiated often pay for in adulthood. Thus, with these experiences at an early stage, an athlete must certainly have been prepared for the challenges of life in his chosen field. Apart from the seeming abandonment of grassroots sports, further factors challenge the capacity of country’s sports sector. Absence of top class infrastructure, technocrats and effective reward system are also part of what has held the sports sector down in the country. No country can produce a world beater in absence of a good facility. Modern facilities enhance performance, especially, competitive edge. Thus, for an athlete to thrive during competition, he must have been exposed to the type of equipment to be used before hand. Often times, Nigerian sports administrators instead of seeing their responsibility as a call to duty tend to exploit the opportunity for selfish purposes. This usually impacts negatively on the performance of the athlete’s. Over time, administrators have failed to key into or try to adapt the success stories of countries like Jamaica, Kenya, USA, and China, who have been sustaining their performances in their strongholds and trying out new things. 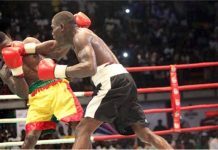 If the national sporting leaders do not take cues from the sporting programmes of such leading countries, then, the sporting prowess, talents and passion for which the black race is known for may slowly ebb out of the country. The performances of team Nigeria at the last two Olympic Games and World Athletics Championships are indicative of the fast dying potency of the country in world sports. They are pointers which glaringly prove that you reap what you sow. That Nigeria is bedeviled by so much challenges that are hurting her reputation as a player in the big leagues of sporting is clearly stating the obvious, but with the human and material resources at the country’s disposal, riding the crest with the big leagues may not be far-fetched, if only the wrong steps are effectively retraced.